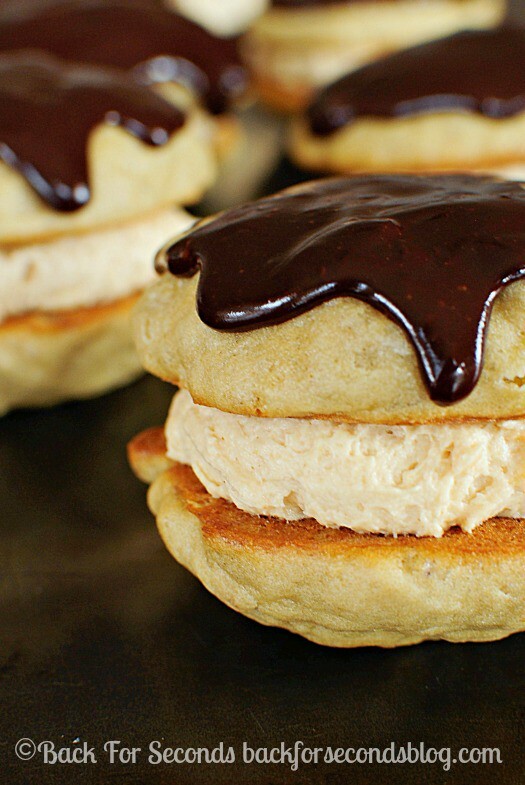 Banana Whoopie Pies with Peanut Butter Cream Filling are the most delightful dessert that everyone loves! The chocolate ganache topping makes these elegant and irresistible! Peanut butter, banana, and chocolate – one of the best combinations of flavors ever! 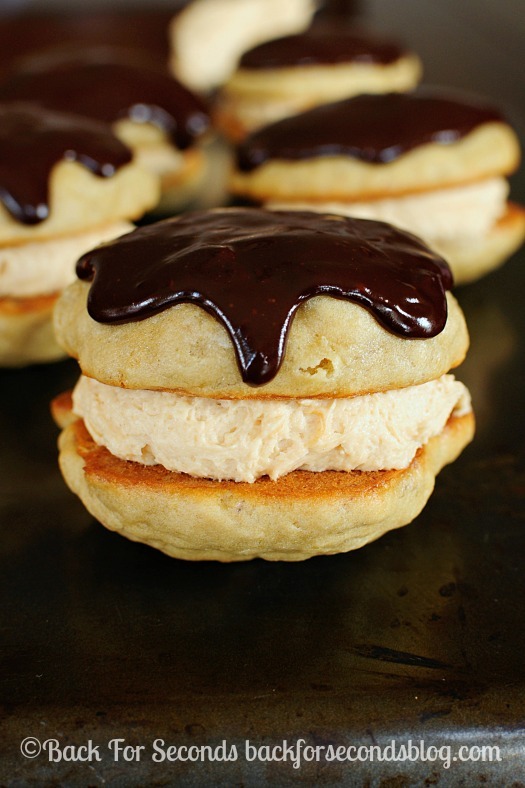 Whoopie pies are like a cross between cookies and cake with a yummy cream or frosting filling. 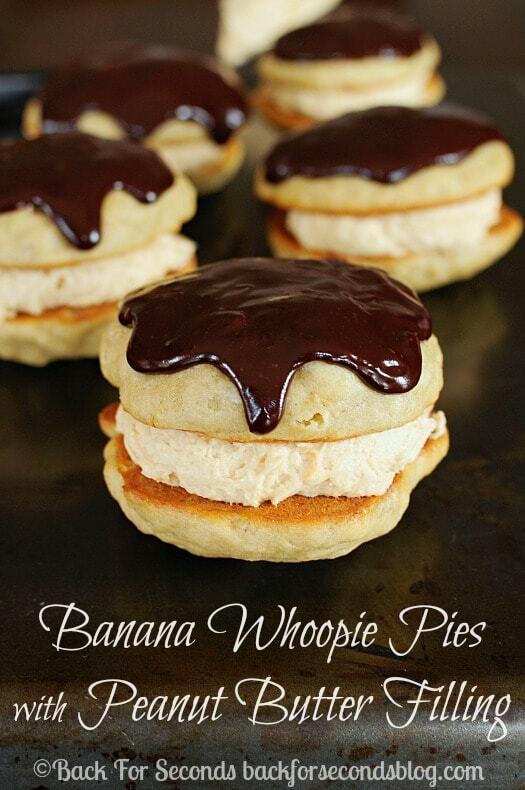 These Banana Whoopie Pies with Peanut Butter Cream Filling are by far the best whoopie pies I’ve ever had! The banana cookies are so light and moist and they pair so beautifully with the fluffy peanut butter filling. I added some chocolate ganache on top because, well, chocolate makes everything better! Thee are such a fun alternative to cupcakes or cookies, and they look so impressive with the glossy chocolate dripping over the top. These get the thumbs up from everyone who tries them. They really are delicious! Great flavor combo- so creative! I also just like saying WHOOPIE pie! 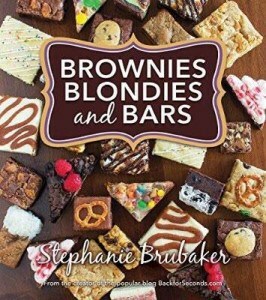 What an amazing group of flavors and the photos make me want to go make them now! Pass some of those over here! Love the chocolate! These sound fantastic! But they do not have to be refrigerated because of the filling having milk? That’s what you get for making whoopie! These would be great for a party or a cute little surprise in someone’s lunch box!